Masonry work is a great way to improve the look of your home, but it can easily break or wear away if not installed correctly. It is best to hire professionals who are expertly trained in concrete masonry work. Whether you need work on a chimney, a patio or a walkway, the concrete masonry contractors at AAA Established Construction can easily install, repair and maintain your stonework. As a family-owned and operated construction company, AAA Established makes affordable pricing our top priority next to efficiency. Our concrete masonry services extend to NJ's Bergen, Essex, Hudson, Passaic and Union counties. Our 17 years of experience has led us to have great customer service skills as well as 100% satisfaction ratings. The concrete masonry contractors of AAA Established offer their services that serve both aesthetic and functional purposes and can increase your property value. These professionals can handle any task from a plain stairway installation to water features. We understand that everyone has their own taste when it comes to decorating their homes so we work closely with our customers to ensure we successfully bring their visions to life. For more information on the concrete masonry contractors of AAA Established Construction, call us today at (866) 590-8190. We recognize that concrete masonry is an ancient building technique, but it is also an art form. If you are looking for contractors in Northern NJ, AAA Established Construction has more than 25 years of experience in masonry, chimneys, gutters, roofing and siding. We are a family owned and operated company that guarantees full satisfaction to all of our customers. Our highly skilled and experienced staff provides high quality services at affordable prices. These can be difficult tasks, but our workers have the proper skills and tools to provide you with a beautiful job. We build a frame and pour cement to make your steps straight and level. This also applies to our sidewalk repairs. We can evenly apply the concrete to make your sidewalk appear seamless. Our bricklaying skills are also superb. Whether you would like a new walkway or chimney, we are more than qualified to provide you with a high quality job. We provide any exterior construction services that you may require. If you would like more information on our contractors in Northern NJ, call AAA Established Construction at 866-590-8190 for a free estimate. Masonry work is a wonderful addition to a home but it can be difficult to install and then maintain. Whether it's steps leading up to your house or a chimney, stonework can easily break if it is not installed correctly. It is better to hire a trusted, professional masonry contractor in NJ that has been in business for many years so you won't have to second-guess your own experience and knowledge. AAA Established Construction is a New Jersey masonry contractor that has been in business for 25 years. As a family owned and operated company, we guarantee 100% satisfaction with all of our customers in Bergen, Essex, and Passaic counties. We provide a variety of services such as building or rebuilding concrete walkways, patios, chimneys, steps, and retaining walls as well as laying brick. While only using top of the line products and materials to complete our job, we specialize in two ancient building techniques that are still relevant today: stonework and masonry. More specifically, we pride ourselves on our indoor and outdoor masonry work . For outdoor work, we can also waterproof a building's foundation for added strength against the elements. For more information on AAA Established Construction's masonry contractors or to get a free quote, call us today at (866) 590- 8190. This local NJ masonry contractor will aid you in your quest to improve your home. Would you like to improve your home by adding stone walls patios? Then you might want to find mason contractors in Bergen County. AAA Established Construction is a family owned and operated business that has been providing Northern New Jersey with mason contractors since 1985. Our Bergen County mason contractors provide both exterior and interior masonry services. For exteriors, we specialize in roofs, chimneys, patios and retaining walls. But our list of skills does not end there. Our masons can also install stone tile to the interiors of your home or business. We will also waterproof a building’s foundation to prevent leakage and flooding. Our number one priority is to bring affordable pricing to all of our customers. We guarantee 100% customer satisfaction. We offer many chimney and gutter services including repair and routine cleaning. We will also install caps and dampers. Whether you are looking to fix up or add to your home or business, our mason contractors in Bergen County are who you need to call to get a beautiful and affordable job done. For more information on any of our services, call 866-590-8190 to receive a free estimate. Your roof is the difference between getting rained on and staying dry, shivering in the cold and enjoying the warmth, and even a sunburn and shade from the harsh rays. With all your roof is able to provide, it is also forced to endure a lot of abuse from the harsh and always changing environment of Northeastern America. Just like the rest of your home, your roof requires some regular maintenance to keep it strong and to repair any damage. However, you should not be doing this yourself because it can be dangerous work up on top of your home. For help with roof repair in Passaic County, AAA Established Construction will do the work for you. One of the biggest hints that you should enlist the help of a roof professional, is if your home is leaking. If water is finding its way into your home, then your roof has damage that needs to be repaired in order close the opening. Other signs of wear and tear are cracking or curling of shingles as well as missing shingles. As a family-owned and operated construction company, we guarantee 100% satisfaction for all of our Passaic County roof repair services. We provide long term solutions instead of quick fixes. A strong and sturdy roof is a roof that is doing what it was designed to do: protect your family from the elements. To find out more about roof repair in Passaic County and to speak with one of our roofing experts, call AAA Established Construction today at 866-590-8190. When a chimney goes a certain period of time without being cleaned, it can pose many safety hazards for homeowners. Chimney cleaning in NJ is vital to maintain proper air flow from inside of the house to the outside of the house and to ensure that chimneys are safe to use. AAA Established Construction is a family-owned company located in NJ. For more than 25 years, our professionals have been working with chimneys, gutters, masonry, roofing and siding throughout Bergen, Essex, Hudson, Passaic and Union counties. In addition to these reasons, outside factors may also have an influence on why you need chimney cleaning in NJ. Leaves and other debris may have flown into the chimney, creating a blockage and making it difficult for air to flow freely. Animals may also take up residence in chimneys by creating their nests within them. This can be very dangerous, especially if you are constantly lighting fires in your fireplace. Any buildup or blockage in your chimney can lead to fires, so investing in chimney cleaning in NJ will help keep you, your family and your home safe. Our professionals work hard to provide you with cleaning services that will give you 100% satisfaction guaranteed. We work quickly and efficiently, and we also offer emergency chimney cleaning services. For more information about our services for chimney cleaning in NJ, or to request a free chimney cleaning estimate, contact our professionals at AAA Established Construction today at 866-590-8190. Like Atlas, the roof of your home must bear a heavy burden over the entire winter season and that burden is, of course, snow. As the days go by, snow continues to get heavier and heavier, putting the strength of your roof to the test. If your roof’s limit is finally reached, the ensuing damage will be costly and dangerous. It is best to check now for any sort of weaknesses in your roof. AAA Established Construction offers roof repair for New Jersey residents to help them stay safe this winter. For over 17 years, we have been helping homeowners with any house repairs that are necessary. The goal of AAA Established Construction is to perform the highest quality NJ roof repair while interfering with your life as little as possible. Of course you will notice the work being done on your roof, but we make it a priority to avoid any collateral damage or anything else that will cause you unneeded stress. We are insured and certified to perform these roof repairs. The best defense is a good offense. Jump at the opportunity now to make your home safer by having your roof inspected and repaired. To learn more about roof repair in New Jersey and to receive a free estimate, call AAA Established Construction today at 866-590-8190 and speak with one of our experts. Maintaining your home is a lot of work. You can not do it all by yourself. AAA Established Construction is a construction company in Glen Rock NJ that was established nearly three decades ago. We are family owned and serve Bergen, Essex, Hudson and Union Counties by offering reasonable prices, quick results and top of the line work to our guarantee 100% customer satisfaction. Chimneys get dirty. During the winter, a lot of smoke passes through. We perform routine chimney cleaning and can repair or rebuild any worn out areas. Since we are already on the roof, working on your chimney, we can repair your roofing problems. We can fix any cracks or replace missing tiles or shingles. Lack of holes will keep your house nice and toasty while concurrently keeping your energy bill low. Maybe you do not need work on your roof. We can still help. Our masonry unit makes beautiful patios, stairs and walkways. Looking for something more complicated? We can install anything you need, even water fountains for your garden. For more information on out Glen Rock NJ construction company, call 866-590-8190 to learn about our roofing, chimney and masonry services. There are many reasons to maintain your chimney and get professional chimney repair in NJ. Fire prevention is a major impetus for getting professional chimney inspections because chimney fires take lives year by year and can be easily avoided. Not only will a clean chimney help your family avoid a dangerous, potentially life-threatening situation, but it will also guarantee that your fireplace is operating as efficiently as possible. Why is chimney efficiency important? The more productive it is, the better your home will be heated during these cold winter months. Harsh weather conditions can also do a lot of damage to your chimney. With all the snow, rain, hail and wind that can appear during this season, you need to be extra vigilant about your chimney’s condition to make sure that it is in proper working order. If you have noticed any of the above chimney issues, give AAA Established a call. Our NJ chimney repair team can inspect your chimney and fireplace to determine where the problem is, and fix it immediately. 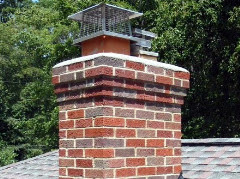 If your chimney is need of repair, rebuilding or inspection, give us a call at 866-590-8190 for a free estimate. Our team of chimney repair specialists in NJ are here to answer all your questions and keep your chimney up to date all winter long. Owning your own home is the goal of so many people and seems to be the ultimate sign that you have made it in life. You can consider yourself successful because it is your house, you own it. However, it is not all smiles and celebrating for long; being a homeowner is a lot of work. Even the best built houses begin to break down after some time and need repairs. It can be very costly, time-consuming, and frustrating to deal with at times, but there are other options. AAA Established Construction is a construction company in Passaic County, NJ that has been helping homeowners for over 25 years. Whether your roof could use repair, chimney needs cleaning, or masonry services are required, our professionals have the expertise to keep you worry-free and your home well maintained. Any damage to your home always runs the risk of leading to bigger damage and more expensive repairs. It is best to let our Passaic County construction company staff take care of any problems before that happens. You have worked hard to create the home that you now have. Why let it fall apart when we can easily fix everything for you? You should be proud when others see your house. Spend your weekends doing something else and let us handle your home improvement responsibilities. To learn more about our Passaic County construction company, call AAA Established Construction today at 866-590-8190. We look forward to speaking with you. If you live in New Jersey, this has been a rough few months for your chimney. Between the inclement weather of Hurricane Sandy and a few snow storms and temperatures alternating between very cold and mildly warm, there is a good chance that your chimney’s structure has been weakened. Because your chimney is so important to the safety of your family, it is important to repair any damage or weaknesses as quickly as possible. AAA Established Construction performs chimney rebuilds in NJ to help you with this. For some homes, NJ chimney cleaning is sufficient for chimney upkeep, but others require more work. Our professionals are well trained in rebuilding and repairing chimneys to keep them working as they should. The danger with a damaged chimney is that your home is at a higher risk for both leaks and fires. We offer a 100% guarantee on all of our services. Our chimney rebuilds in New Jersey are long term solutions and not temporary fixes. Although you may not be sure of its condition, the chimney on your home must always be sturdy in order for it to safely do its job. Leave any uncertainty out by letting us perform a chimney rebuild for you. To find out more about our NJ chimney rebuilds and to receive a free estimate, call AAA Established Construction today at 866-590-8190. We look forward to hearing from you. AAA Established is a construction company in NJ that has been in the business since 1985 and provides many construction services throughout the state of NJ. We are a family-owned and operated company that offers 100% satisfaction guarantees on all of the services we provide. We only use top-quality materials on all of the jobs that we complete. Our services are all reasonably priced. Whether you are getting a cleaning to keep up with routine maintenance on the exterior of your house, or if we are installing a new roof for you, the services you hire our construction company in NJ for will be done quickly and efficiently. Our professionals have years of experience under their belts, and they are more than happy to assist you in any way that they can. When you choose AAA Established Construction as your construction company in NJ, we will provide you with a free quote on any of the services you inquire about. To find out more information about these services or about our company, contact us today at 866-590-8190!